PLEASE NOTE: In the summer months we rent our weeks Sunday to Sunday, rather than the traditional Saturday to Saturday. Since the North Conway area is quite popular that time of year, cleaning crews tend to do a much better job on Sundays. Also, we do allow for shorter bookings, as long as they begin or end on a Sunday. We offer deeply discounted tickets to various area activities. Winter months: ski and tubing tickets to Mount Cranmore, Black, Attitash and Wildcat mountains. Summer months: zip lines, gondola rides, both Attitash and Cranmore outdoor parks including water slides, mountain coasters, aerial adventure parks and more. We are from the Boston area and have been visiting North Conway for many years for family vacations. We have a daughter, and travel with her often. Birch Retreat is in really quiet neighborhood, with lots of space between the houses. You can barely see any neighbors. We love the mountain and forest views, as well as the peaceful setting. Sitting by fire with a good book, watching the birds on the feeder, or grilling on the deck are some of our favorite times. Birch Retreat is on 1.4 acres with a mountain view. Although it is just over a mile from the middle of town, the setting feels completely secluded. The living room has a great view of both the mountains and the plethera of birds that frequent the feeder. It is a great house for two families, with living rooms both upstairs and down. Kids can really have their own hang out space downstairs, while the parents can relax upstairs. Amazon Prime and Neflix ready, bring your passwords! Cranmore ski area is 2 minutes down the road. We offer deeply discounted ski and tubing tickets to Mount Cranmore, Black, Attitash and Wildcat mountains. No stairs are required to enter our house. The main living level is up one flight of stairs that has a hand rail. whirlpool tub; PlayStation; full size crib, baby gate, high chair, booster seat; basketball hoop (with ball). Discounted mountain coaster, tubing and ski passes for Attitash Mountain Resort, Mount Cranmore and Wildcat Mountain! We also offer discounts at the Cranmore Family Fitness Center (gym, fitness classes & more). Love going to Birch Retreat, it is a great week to look forward to every year! Very comfortable! We love having our Thanksgiving celebrations here since about 2005. Katie and Tony are wonderful to deal with too, especially with little issues that arise. This house is central to everything, shopping, dining, skiing, the Santa parade, churches, tubing right down the road, art galleries, puzzle store in Jackson, and trails for a nice walk. In the years we have stayed in this comfortable, family orientated home, we have seen a bear sliding down the hill on the side yard and more recently large tom turkeys came for a visit in the driveway, just as Thanksgiving was here! We love watching the birds in the feeder for a closeup view of their feeding habits. The kitchen is great for a big dinner celebration and the updated granite countertop looks very nice too. 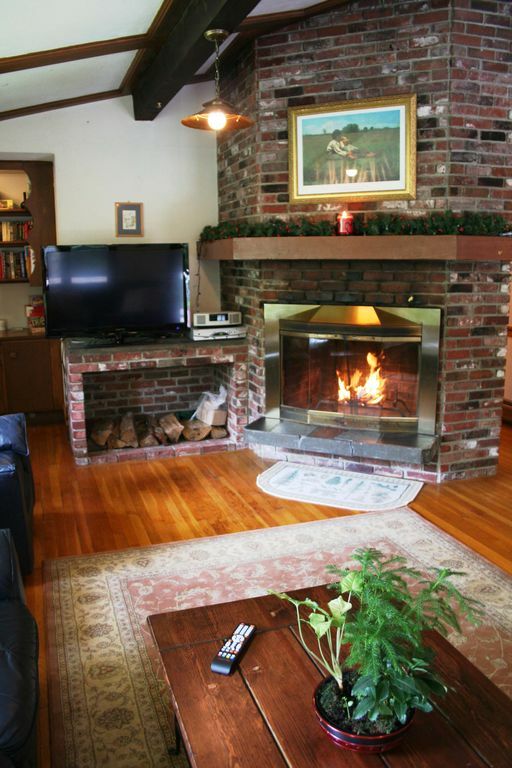 The best part is a long game of Nantucketopoly or the Dating Game with the family, by the fire in the living room. Love Birch Retreat! Situated just two miles from the center of North Conway (Kearsarge neighborhood), this home is convenient for all north country activities: skiing (Mount Cranmore - 5 min, Attitash / Bear Peak - 10 min & Wildcat - 15 min), hiking, climbing, swimming, canoeing and outlet shopping. The North Conway area features attractions for the whole family including winter sports, golf, mini-golf, alpine and water slides, mountain biking, and scenic train rides as well as fine dining, theater, and night life. We offer discounted mountain coaster, tubing and ski passes for Attitash Mountain Resort, Black, Mount Cranmore and Wildcat Mountain! We also offer discounts at the Cranmore Family Fitness Center (gym, fitness classes & more).